WASHINGTON, D.C. -- Americans' satisfaction with both race relations and the situation for blacks and other racial minorities in the U.S. edged down from last year, the only two areas of the 28 Gallup measured to decline significantly over this period. Americans' current satisfaction with aspects of life and national policies varies significantly, ranging from 22% who are satisfied with the state of race relations to 80% who are satisfied with their overall quality of life. Satisfaction with the position of blacks and other racial minorities is also among the lowest of the 28 areas measured. The biggest positive changes over the past year were increases in Americans' satisfaction with the state of the nation's economy, up 12 percentage points, and the level of immigration into this country, up 11 points. By contrast, satisfaction with the position of blacks and other minorities fell six points, from 43% to 37%, and satisfaction with race relations edged down five points, from 27% to 22%. These data are from Gallup's annual Mood of the Nation poll, conducted each January since 2001, except for 2009-2011. The most recent poll was conducted Jan. 4-8. At least half of Americans were satisfied with the state of race relations in most years since Gallup first asked the question in 2001, including 55% in 2014 when race relations was among the higher areas of satisfaction. 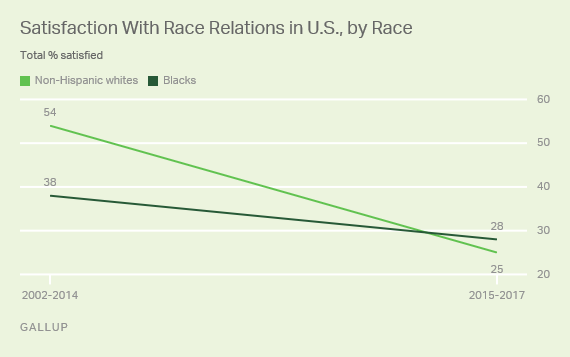 In the past few years, however, satisfaction with race relations has dropped precipitously, falling to 30% in 2015, 27% in 2016 and now 22%, the lowest to date. The most likely explanation for this substantial shift in attitudes about race in the U.S. is a series of deadly incidents that have occurred in recent years involving black men and white police officers. These included the deaths of unarmed black men in Staten Island, New York, and Ferguson, Missouri, in 2014. In both instances, grand juries subsequently decided not to indict the police officers involved. In the years since, deaths of black men and women at the hands of white police officers in Maryland, South Carolina, Minnesota and elsewhere continued to fuel the fires of controversy over the treatment of blacks by police -- a situation further exacerbated in 2016 by the targeted killing of white police officers in Dallas and Baton Rouge, Louisiana. Americans' satisfaction with the position of blacks in the U.S. has shown a similar trend. Other Gallup measures have shown that public worry about race relations jumped in 2015 and 2016, that race relations has risen on Americans' list of most important problems, and that twice as many Americans say that the nation lost ground as gained ground on race relations since Barack Obama became president. The drop in satisfaction with race relations is evident across all major demographic groups, including gender, education, income, age and region. Comparing satisfaction from 2002-2014 to 2015-2017, the downturn is much larger among whites than among blacks. Across the earlier time period, whites, on average, were significantly more positive than blacks about the nation's race relations, at 54% and 38%, respectively. Whites' satisfaction has fallen over the last three years by 29 points, while blacks' satisfaction has decreased by only 10 points. As a result, whites are now less satisfied than blacks with race relations, a flip from previous years. The same pattern is evident in the trend among Democrats and Republicans. 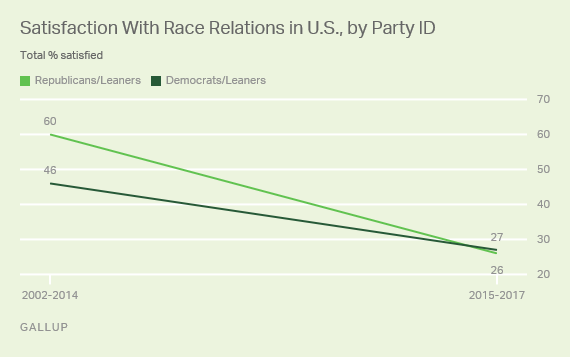 Republicans were significantly more satisfied than Democrats with race relations from 2002 to 2014. GOP satisfaction has fallen dramatically over the past three years, putting Republicans in a position where they are tied with Democrats on this measure. More than seven in 10 Americans in late 2008 said that the election of Barack Obama as the first black president in U.S. history constituted one of the most important advances for blacks in the past 100 years. These views faded as his presidency continued, however. Over the final three years of Obama's presidency, Americans also have become much less satisfied with race relations than they were during his first years in office and during most of the George W. Bush administration. Clearly, despite the historic nature of his election, Obama's legacy is not going to be focused on achieving racial harmony or erasing the race relations problems that have been a part of American culture in one way or another since the nation's inception. President-elect Donald Trump's rhetoric surrounding race and ethnic and religious minorities since the beginning of his presidential campaign has been controversial. Trump has promised that black Americans will, within four years, be thankful for his presidency and vote for him in large numbers if he runs for re-election in 2020. How Trump's actions and policies will affect either the reality or the perception of race problems in the years ahead remains to be seen. Gallup's last two measures of Trump's image show that blacks are three times less likely than whites to view Trump favorably (16% vs. 51%, respectively).